This week, we enjoyed one super long (arrived in the parking lot at 8:30 am, left after 10 pm) fun day at the Magic Kingdom. While this is the "happiest place on earth", there were some things we did that made it happier, especially with little kids. I felt like the stakes were high for making this visit successful, since we only had one day and we won't be back for several years. Following these tips made it really great. 1. Bring food. And other necessities. Theme park food is expensive and requires waiting in line to obtain it. I was so happy we had a nice selection of snacks in my backpack. We even packed pb&js to eat for lunch. Disney's policy on outside food is generous, so don't hesitate. We also brought rain jackets, a change of clothes for the two-year-old, hand sanitizer (do you know how many other germy kids have touched those handrails? ), sunscreen, lotion, etc. Piper is eating some white chocolate pretzels while we wait on Enchanted Tales with Belle. 2. Have a plan and prepare your kids in advance. Make a list of rides you want to visit. That way, you're not standing around discussing which attraction to go to next, and you don't end up waiting in a long line only to have your child back out as soon as it's time to get on. 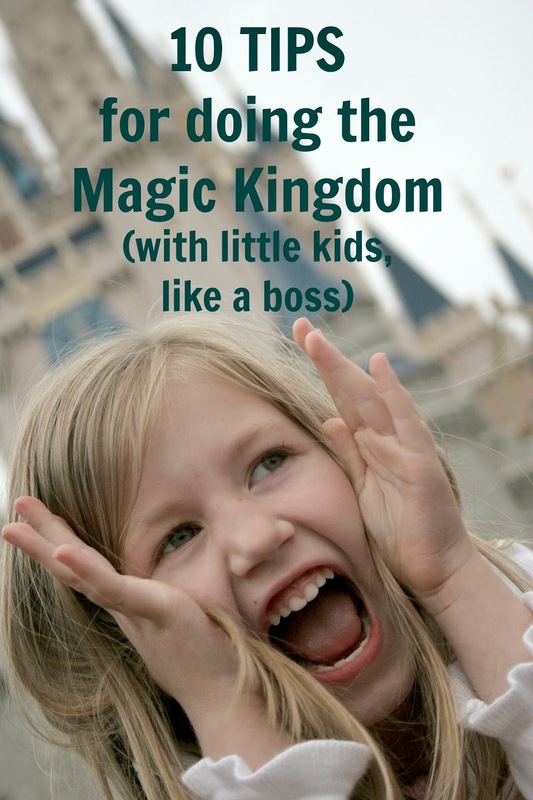 Watch YouTube videos of the rides so your kids have an idea of what to expect. If you have a child who is especially sensitive, prepare them for loud noises, crowds, and automatic flushing toilets. We had to talk a lot about how everything at Disney World is pretend. Disney has a system where you can skip the line on some rides and attractions. It's called Fastpass+. I recommend getting your fastpasses first thing and trying to get them for attractions with the longest and most boring lines (Peter Pan, I'm looking at you). For more info, visit WDW Prep School here. You can see a chart for the rides most likely to need a fastpass here. 3. Don't wear a princess costume, but do have fun with themed clothing. My mother-in-law (Dassa) and I were pitying a poor child we saw around lunch, in the blazing sun, who was wearing a full Merida costume and a giant red wig. Do you know what those princess costumes are made of? Polyester. Do you know what polyester doesn't do? Breathe. Do you know where it's hot? Florida. You see what I'm saying? It also seems like those costumes would be hard to move around in and could rip easily getting in and out of rides. Cadence wanted to go full on princess, but I talked her into wearing a pretty pink sundress with Disney princesses on it. Dassa had made these sweet cotton dresses for both girls last summer and they were perfect. There was even a woman in line behind us who asked where she could buy one. (The fabric was from Wal-mart.) We layered a little sweater over for first thing in the morning and as it got dark, so they were cool during the day and warm at night. I think Disney t-shirts would have been fun too. You can't see it but there's princesses on their dresses. Ariel would approve. 4.Bring entertainments for the lines. This is the most important tip I have to share. For most of the newer or refurbished attractions, Disney does a good job of making the lines interactive. Winnie the Pooh has games for the kiddos for more than half of the line. Dumbo now has an indoor playground and you get a beeper to tell your party when it's your turn to ride. But...the waits for It's a Small World, Jungle Cruise and Enchanted Tales with Belle were excruciatingly slow and boring for small children. So, it's great to have something to do. Playing with bees while we wait to ride in a honey pot. I threw a small bottle of bubbles in my backpack and I literally had other parents thanking me for having something like that not only for my kids but for the kids next to us too. We ate snacks in line (there's trash cans throughout the queues). We looked at the park map and plotted our next stops. A family in front of us distributed Mickey mouse stickers, and then played the "who can be quiet the longest game?" The atmosphere around the park is so interesting and the theming so complete, that it's nice just to sit and take it in. And eat ice cream. Dassa bought us Disney ice cream. It was good. 6. Meet a few characters. But don't splurge on character dining. I looked at the character dining options, but they were pricey, and I wasn't sure how much we would like trying to meet characters, take pictures, and eat a decent meal all at the same time. We met Belle in the Enchanted Tales with Belle attraction and it was great. Cadence was unsure about meeting other characters, but Piper was all for it. So, we stopped in to meet Tinkerbell and her fairy friend Rosetta. It was even better. The fairies weren't just posing for a picture and moving on to the next group, they talked to both girls for several minutes and were SO IN CHARACTER. Seriously, Tinkerbell stomped her foot when Cadence said she didn't want a picture with her. Matt and I loved it. We encountered the ugly stepsisters from Cinderella while we were walking around Fantasyland near the castle and they were perfectly on point too. One of them stopped in front of a little boy crying in his stroller and said "Are you throwing a fit? That's not allowed. This is the happiest place on earth." When Dassa tried to say hello to her, she put her nose in the air and walked on. Fun stuff. Now, those are all what Disney calls "face characters", meaning they don't wear masks. The characters that do, like Mickey or Tigger, aren't going to interact in the same way. Maybe a character meal with them would be worth it. 8. It's worth it to get there a little early for good viewpoints for the parade or a show. We found what we considered to be the best spot to view the Main Street Electrical Parade, thanks to arriving a little early. Most people seem to line up for this parade on Main Street, but we wanted to avoid the crowds, so we picked a spot in Liberty Square on the corner of the parade route in front of the riverboat boarding area. Turned out, being on the corner facing Main Street meant we saw all the floats coming toward us and then they all slowed down to turn and we got to get a nice side view too. When we arrived early for the parade or the show earlier in the day, we took that time to rest a bit, and enjoy the atmosphere and the entertainments from the backpack. 9. Bring your own glow items for after dark. .
Two words: Dollar Tree. Piper and Cadence got $1 Disney-themed glow wands in their Christmas stockings and we broke them out as we were waiting for the Main Street Electrical Parade. We were sitting right in front of the cart selling all the Disney glow stuff and they didn't ask for any of it, or even seem remotely interested. 10. Be cool if your plan doesn't work out. We really wanted to have lunch at Be Our Guest, the Beauty and the Beast themed restaurant. But the line was super long, starting at about 10:30, didn't get better, and it was too late to get reservations for dinner. I was grumpy about it but then I sucked it up and we rode Dumbo. I realized that if we had waited for lunch there we really would have missed out on a lot of other attractions. Nothing will ever go quite as planned, right? Anyone have any other good tips?